flute&everything. 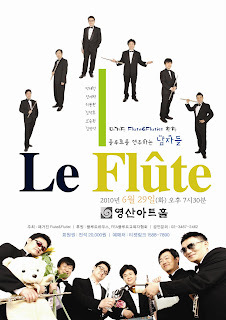 flute& is culture ! It is so fresh and fantastic and funny concert ! Sound of Music(the concerts title say "SOM"). G.Rossini(1792-1868), S.MERCADANTE(1795-1890), L.V.BEETHOVEN(1770-1827) , W.A.MOZART(1756-1791), G.Bizet(1838-1875), and R.Rodgers(1902-1979) - SELECTIONS FROM THE SOUND OF MUSIC for flute sixtet. Park Hai-sung, Jang Jae-hyuk, Lee Bong-hwan, Kim Hak-mo, Jo Seung-hwan, Kim Byung-suk. 본 블로그의 모든 게시물 저작권은 LAREINE HAN에게 있습니다. 깔끔 테마. Powered by Blogger.